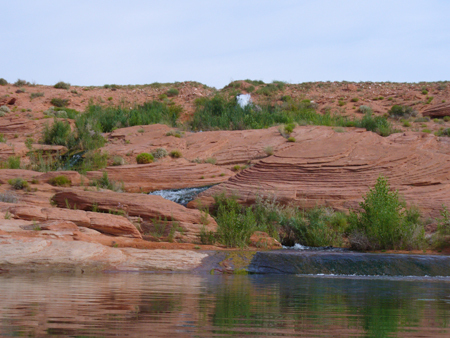 Sand Hollow Reservoir is located just minutes from St. George, Utah in Washington County. It is connected to Quail Creek Reservoir by an underground pipeline, and water can be pumped back and forth between the two sister reservoirs. Sand Hollow has become a hotspot for largemouth bass and bluegill fishing in the last few years. Main Entrance Gate: Open 6 am – 10 pm. The park gate is closed from 10 pm – 6 am April 2019 through Sept. 2019. Quagga: All out of state boats will be inspected before launching. All ski/wake boats must have drained and dry tanks/bags. 30 day dry time or decontamination wash for ALL ski/wake boats with ballasts tanks/bags. When traveling from one lake to another, please be sure to pull your drain plug. Campgrounds: Open though reservations are recommended. Beach camping is first come first serve. Water levels are high so primitive camping will be limited during holiday weekends. Water Level: Water level is %92 and rising. Main launch ramp is open and launching conditions are great. The South side boat ramp is also open now. No spear fishing is allowed. Road Conditions: Good Do not drink and drive! Fire Conditions: Fires are allowed in designated fire rings only or self owned burn pans. No pallets! NO FIREWORKS, that includes sparklers, fire crackers and anything that says fireworks. Graffiti on the rocks has become a problem again. This is your park, help us keep it open, clean and beautiful. If you see someone carving in the rocks, please report it. No glass bottles on the beach or jumping rocks please. All dogs must be on a leash. Owners of dogs off a leash will be cited. Park entrance gate closes as 10 pm Utah time. Campers need to be in the park before the gate closes. With the very high water levels primitive camping will be limited during weekends. Self contained units only as there are no hook ups on the beach. There are new pit toilets which were installed last week. The shores are sandy. If you get stuck you will need to call a tow truck. Park staff can not pull you out of the sand. Avoid gray sand near the waters edge, it is not dry underneath and you may get stuck. Swimmer’s Itch: Is not active. Limit 6 Largemouth Bass only 1 may be over 12 inches. No limit on smallmouth bass. Anglers must not release any smallmouth bass they catch. All smallmouth bass must be immediately killed.